I worked the sea edge in short lengths of scroll stitch in close pastel blues. The idea was to create the sense of the ripples at the edge as a wave settles and flows back down the beach – but only on one side of the sandy bar that leads out to the island. I wanted to create the sense of a prevailing wind that came at an angle so that the waves would be more noticeable on one side than the other. Cloud, island, and sea suitably depicted, I could leap in and render the Sea Tractor in all its outlandish and spindly glory. The Sea Tractor was great fun to do. I worked bi-coloured Dorset Buttons for the wheels, to evoke the painted metal hubs – pretty ambitious for my second and third Dorset Buttons ever! The canopy and the base of the chassis seem to be in Brick Stitch, the main structural elements are either stem stitch or back stitch – the latter in particular for the terrifyingly spindly steps. Notice, by the way, that the steps themselves didn’t actually make it into the embroidered version. I wish I could say that was to emphasie the spindliness – that would be why I would do that now – but I have a strong suspicion that it was really either forgetfulness, or simply not being able to get the angles quite right. I used heathered stranded cotton (red and black) for the engine-mounting, and ordinary black for the exhaust pipe that goes up through the roof. The planks that create the side barriers were a bit of a challenge. 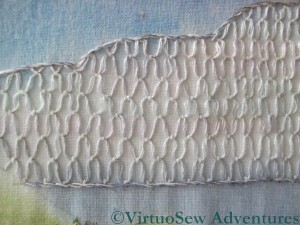 In the end I settled on two long stitches in one colour, couched down in herringbone stitch in a lighter colour. I think they make pretty convincing planks, and looking at the detail, I even added the bumper at the back. 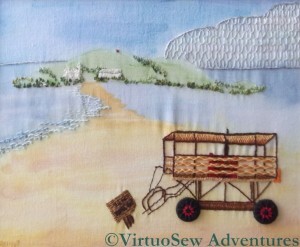 I didn’t include the barriers of the back or far side of the sea tractor, but I do recall thinking about that point. Even a painter – even a photo-realist painter – has to edit their image to make sure that it “reads” properly. Often this is a matter of making sure that the colours of things in the background recede sufficiently, but sometimes that isn’t enough. In this case I decided that adding those details would make the Sea Tractor even harder to work out, and discretion would be the better part of valour. 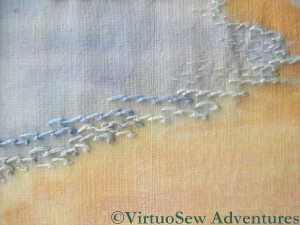 There really wasn’t enough stitching on this piece to qualify for a needlework competition, but I enjoyed working it! 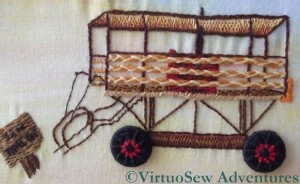 This piece was intended as an entry in a competition run by “Needlecraft” Magazine about 25 years ago. The brief was to recreate “A Holiday Memory”, and as it happened, that year we had had a great adventure – a ride on the Sea Tractor at Burgh Island in Devon. 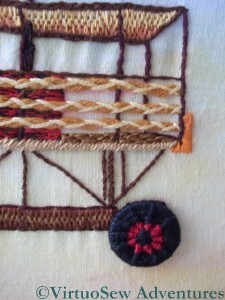 “Needlecraft” had also run an article shortly before, describing and teaching Dorset Buttons, and they seemed perfect for the Sea Tractor’s wheels. 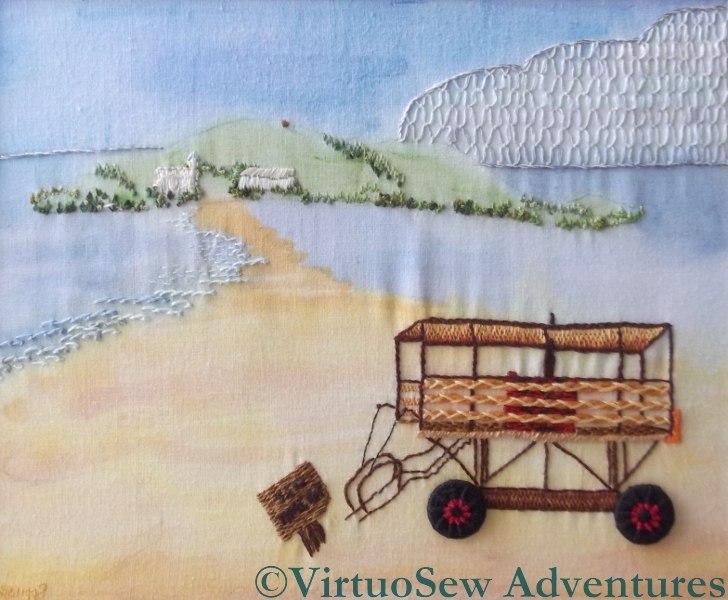 Since time was short and the complexity of the Sea Tractor likely to be time-consuming, I also experimented with a painted background on my cotton fabric. In retrospect, the painted background isn’t hugely successful, and it doesn’t have enough stitchery to qualify for high marks in an embroidery competition, but I enjoyed adding those details I did create, and so often in these early pieces, you can see “Rachel-Now” and her ideas prefigured in the stitch choices of “Rachel-Then”. Looking at it now, I might have done better to work the cloud filling smaller, in white rather than pastels, over a painted base, and without outlining it. Still when you consider that the whole thing was an experiment….! 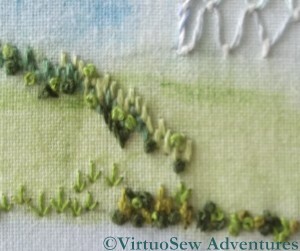 The hillside details involved a lot of different stitches in lots of different greens. There are straight stitches, French Knots, chain stitches, and arrowhead stitches (upside down to look like shrubs). 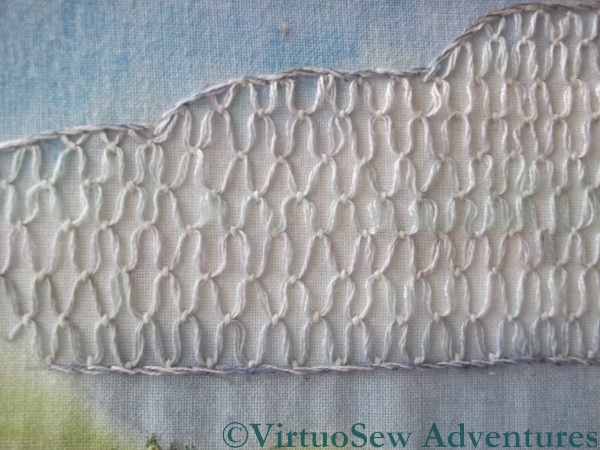 Again, if I were to work this now, there would be a great deal more stitchery in it, but I suspect that the combination of lack of time, and a disinclination to work areas of repetitive stitching led me to stop before I should have done. What I can’t, now, recall, is whether I was pleased with it at the time. I’ve had it propped up in my living room since I rediscovered it, and I’m very tempted to crop it to show just the Sea Tractor itself – which would at least afford me the opportunity to re-block the piece and get rid of the ripples!